Private labeling is more than putting your company’s name and logo on a product. It is a representation of your company, your identity, and your reputation. The products you choose to private label should meet the same high-standards you set for your company. Camie products are recognized and sold worldwide, and those same quality products are available to your company for a private label program. With a custom-designed label, it is easy to build customer loyalty and strengthen your brand with a line of Camie’s quality formulas. 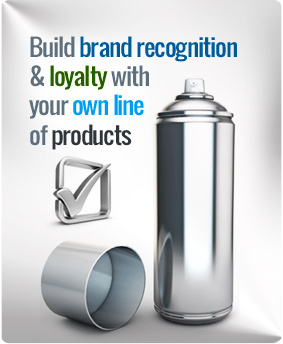 With a wide range of professional strength, high-quality aerosol and specialty products to choose from, Camie customers have the advantage of building and expanding their product lines without expense and delay. Camie-Campbell offers private label formulations for a wide variety of customers interested in marketing products under their label. We address every aspect of research and development, production, quality control, packaging and labeling to ensure regulatory compliance. Our goal is customer satisfaction. Our Technical Staff offers custom formulations as well.